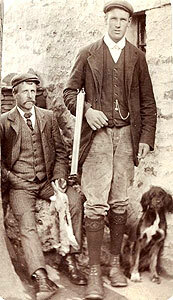 Joseph Harker (left) was born in Gunnerside in 1863 and died in 1960. 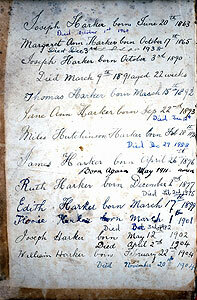 He married Margaret Ann Hutchinson in 1889 and they had ten children. 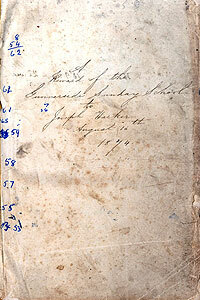 His brother, Thomas, born about 1857, was the father of Ruth Harker, whose collection of postcards appears elsewhere in the archives. 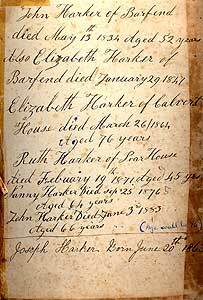 Joseph was a descendant of William Harker of Scar House, Muker, born about 1748 and Hannah Calvert of Scar House, Thwaite, born about 1752. 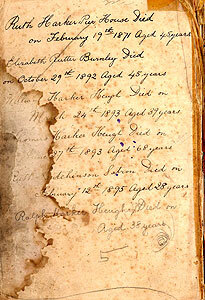 They married on January 3rd 1773.
in which the family's births and deaths were faithfully recorded on the inner covers. Another photograph of Joseph Harker (seated) with a pair of unfortunate rabbits. The gun owner is believed to be Thomas Axby Dougill.